The site’s been quiet of late, but that’s got a lot to do with my being quite busy the past several months! Writing has begun to eat up a great deal of what little free time I’ve enjoyed since starting a new (40-hour a week) position, but I’ve found time to make some beautiful new pearl pieces and experiment with some new designs with Swarovski bicones. 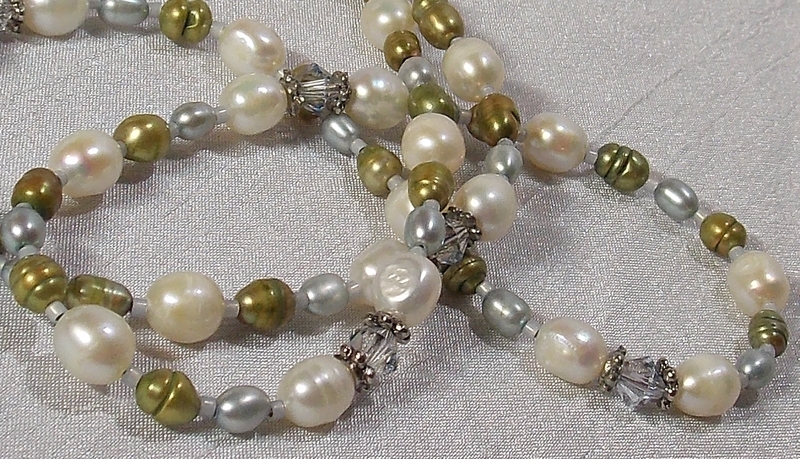 Some of the new pearl designs are up in the Etsy shop. I’ll be doing the Athens Festival Craft Show at Larson Middle School on November 17, 2012 and have applied to do the Crafter’s Clearance at Henry Ford II in February. No other shows lined up yet, but if you like my work and would love to see me at your local show, drop me a message and I’ll be happy to look into it. I am limited largely to the Detroit Metro area at this time, though, so keep that in mind! Commissioned pieces are available; just drop me a line here or on Etsy (Etsy is often the better bet!). This entry was posted in General information, Shows.